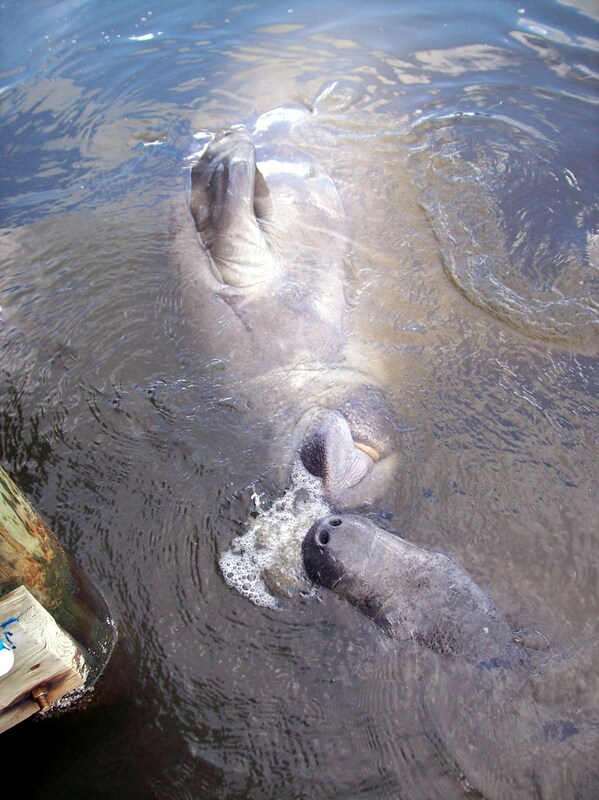 What possible problems could these gentle giants, the manatees of the space coast provide on a moonless night? My wife and I attended a local Meetup to participate in a bioluminescence paddling experience. 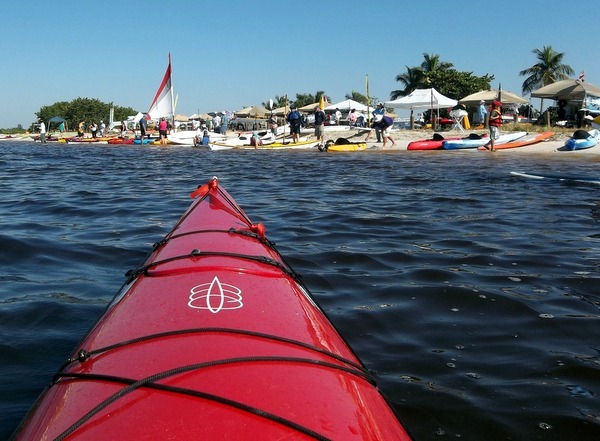 Approximately eighty paddlers parked on the causeway outside the north west entrance to Kennedy Space Center to get experience the nocturnal living glow of dinoflagellates plankton. The space center is renowned for rockets and huge striped-legged Marsh Mosquitos. The Space Coast is home to amazing dinoflagellate plankton that lights up the water when disturbed by paddle or fish. Did they know the lagoon? Liberal amounts of insect repellant was applied, at least by those used to the east coast nightly vampires. 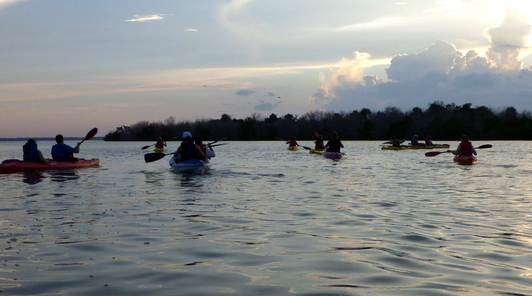 Nearly all my fellow night paddlers were from the Orlando area of fresh water lakes and sandy rivers. The salt marsh estuaries and wide open lagoons of the space coast were alien to most of the paddlers I thought, observing the almost a different type of paddle craft per person. I also wondered if they were aware of the sting-rays and occasional alligators that inhabited this area of the lagoon? Safety on the lagoon is a big deal. There was no safety briefing or plan as we entered the water, only a vague promise not leave the slowest of the paddlers behind. 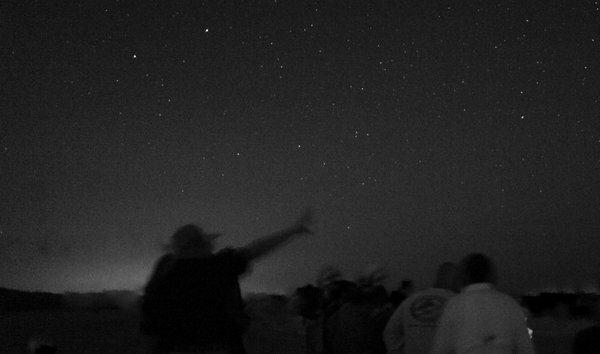 No moon tonight and eighty boats to keep track of……. What could possibly go wrong? With the sun setting pink and red, anxious and excited paddlers began to push into the Indian River Lagoon and we followed the herd of paddling primates into the water. The nominal leader of the Meetup took one look at his flock and struck off at a brisk pace into the lagoon at near five miles per hour by my GPS. This leader (I err in describing him a leader) was in a fast Epic kayak, the identical model of my wife’s and we had no problem keeping up with him and in fact quickly left behind 77 other paddlers who in their slow kayaks paddled the strange waters of the lagoon on a moonless night. Things were not as bad as described, the normal unpredictable winds had not materialized allowing the mosquitos to trail the paddlers far out into the shallow lagoon but not making conditions impossible for the slower boats to return to shore and causeway to KSC offered a distant beacon to where the cars were parked. Lastly, the very nature of the slow boats allowed this Meet-up group to retain some semblance of organization despite the near total black out conditions. Still I was angry at the Meet up leader for leaving the folks behind and my wife and I circled back to check on the slowest of the slow boats. We passed dozens of little clusters of boats, which had basically grouped together in the dark by their boat speed and physical conditioning. And there were complaints. Lots of complaints. While I could sympathize, I also knew the conditions could be far worse. And that is when we saw them, a dim glowing, high out of the water and seemingly a hundred strong. In the hum of salt marsh mosquitos, splash of jumping mullet and complaining kayakers I could hear new voices approaching in the “glow” Actually 50 to a hundred separate glows. And then the first of the paddlers approached us. Stand up paddle boarders wearing glowing neck rings -an endless parade of them. Just as we glided past the sweep, we heard the familiar whoosh of a large splash, the sound of a startled manatee or porpoise. However we could not rule out an alligator or even a bull shark in the estuary waters. Whatever animal caused the splash, the two stand up paddleboarders were thrown into the air to splash into the lagoon. This we knew because we could observe two glowing neck rings "flying" into the air. I yelled “Man Down!” to the disappearing paddler board group (not one of them heard me call out or perhaps they just did not know our location in the dark) and we paddled to assist the two fallen paddlers. Our kayaks are FAST, and we were next to the two fallen paddlers in seconds. Even in the dark I could see one paddler was a woman and her posture (she had crawled back on the board) expressed pure terror. The other paddler-a boyfriend or prospective date? (Been on these types of disaster dates) Was recovering a little better but shaken. I was certain they had paddled over a sleeping manatee and those docile animals with their huge tail fluke creates an explosion of white water and corresponding wake when startled. We knew-been there-having barely staying upright when lifted out of the water by panicked manatees. The woman did not answer-she only trembled (Did I hear a whimper?) in the starlight on her hands and knees having crawled onto her paddle board. The gentleman suitor responded “Not Cool Man, Not Cool!” in a shaky but indignant voice. Well it could be a shark I thought. Or one of those big Jurassic Park alligators that live along the mosquito marsh impoundment of the Space Center. The two paddlers-the woman was still silent, the man replied they were alright and they had to catch up to their group--which had kept paddling in search of elusive Bioluminescence. --Did I mention that there was no Bioluminescence to be found on that warm mosquito-ish night? We called it a night and paddled back to the launch point-more than a little disgusted with the meet up "leader"
--Had to laugh out loud when the following week, the Meetup organizer sent out a an email stating that his meet up groups never leave the slower members behind. 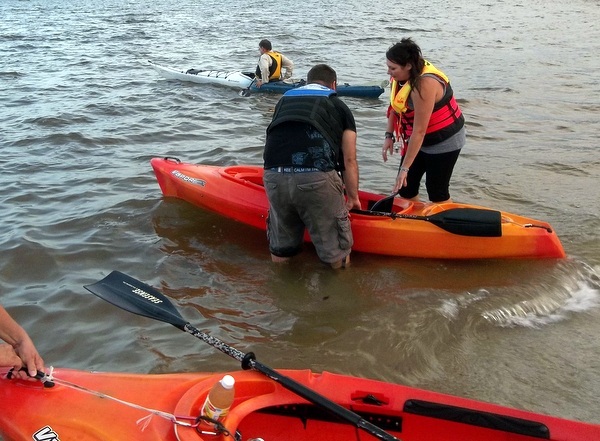 To his credit, all of his day meetup paddles had a safety sweep behind the slowest paddler. Night on the open lagoon can be a different beast. Final note: I am always watching out for unsafe things....and it is always a little worrisome that most people on stand up paddle boards do not have some type of PFD. --Disaster awaits from the next tail fluke of a friendly manatee. Return home from: bioluminescence paddle disaster.